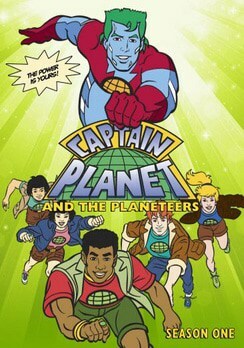 In celebration of Earth Day, Captain Planet and the Planeteers-Season One is being released on DVD on April 19th. I have been very impressed with the content of this super hero style cartoon series because it appeals to a young audience and teaches children to protect the Earth from those who will harm it. Captain Planet and the Planeteers are guided by the ancient wisdom of Gaia and five young planeteers combine their individual powers of Earth, Fire, Wind, Water and Heart to form the iconic hero, Captain Planet! Each episode is an action packed adventure to fight the Eco-Villians which also teaches children about recycling, saving the Earth, not smoking and helping the planet by not littering. In fact, at a recent trip to the beach, my three little ones become incensed when they noticed trash and cans littered on the ground and “educated” us about people who litter. We were excited to watch episodes together from Season One, on this comprehensive four disc DVD set and we were not disappointed. There are a total of 26 episodes and an approximate running time of 10 hours! I appreciate that each Captain Planet episode ends with a 30 second tag about how people can make a difference and I use it as an opportunity to talk to my children about how important it is to take care of our Earth. You can watch a clip from PSA from Captain Planet about buying recycled products. Captain Planet and the Planeteers-Season One is available for purchase at Shout! Factory for only $23.99 + shipping which in my opinion is a really excellent value for this DVD set and would make an excellent gift for kids of all ages.